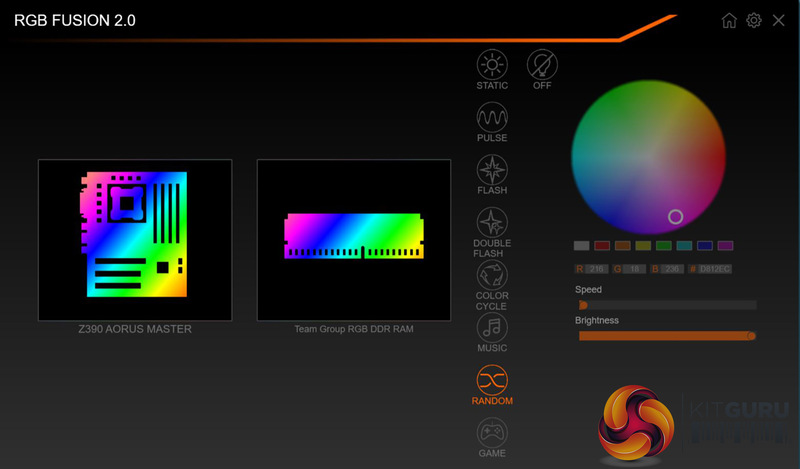 These are important points, however we were also very keen to see how the RGB looked when the RAM was running. 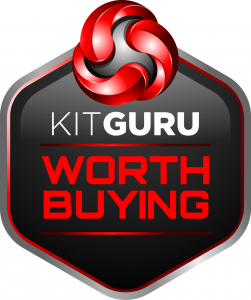 Here at KitGuru we like our bling and we really appreciate a decent light show. 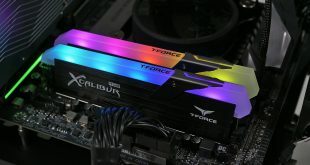 We tested the Team Group T-Force Xcalibur RGB 16GB DDR4-3600MHz on the same Core i9-9900K platform we used for our review of the Gigabyte Z390 Aorus Master motherboard, and this gave us some fun times with the RGB software. 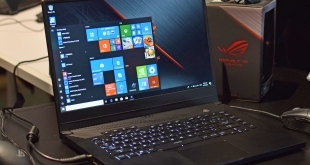 As we say in our video, the SSD we had been using with the Gigabyte motherboard was loaded with Aorus RGB software that worked perfectly with the RGB lighting on the motherboard. 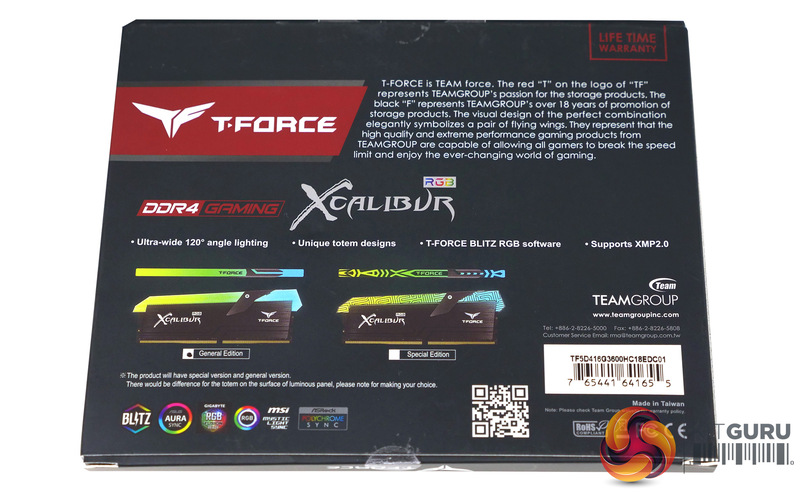 When we added the Team Xcalibur memory we uninstalled the Gigabyte software and installed their TForce Blitz RGB software v1.01.04 which failed to detect the memory. 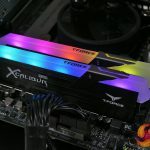 Switching to a different SSD with an installation of Windows that had not had RGB Fusion previously installed meant we were able to install Blitz correctly. 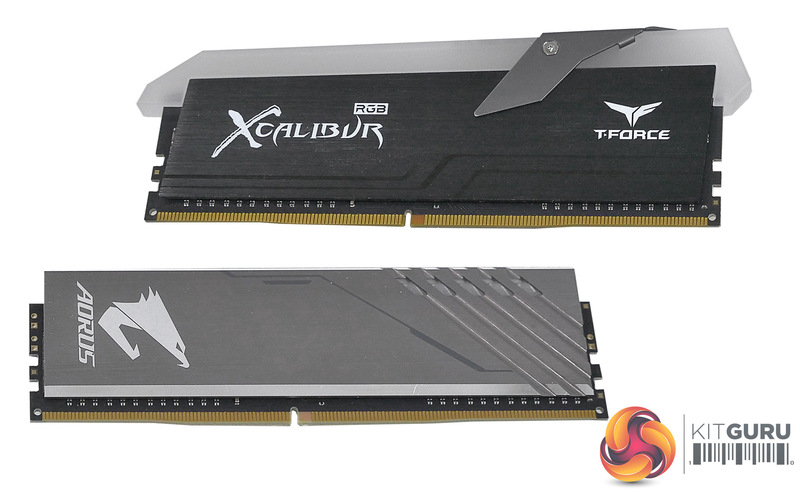 The obvious problem was that this now meant the motherboard lighting was flashing randomly. 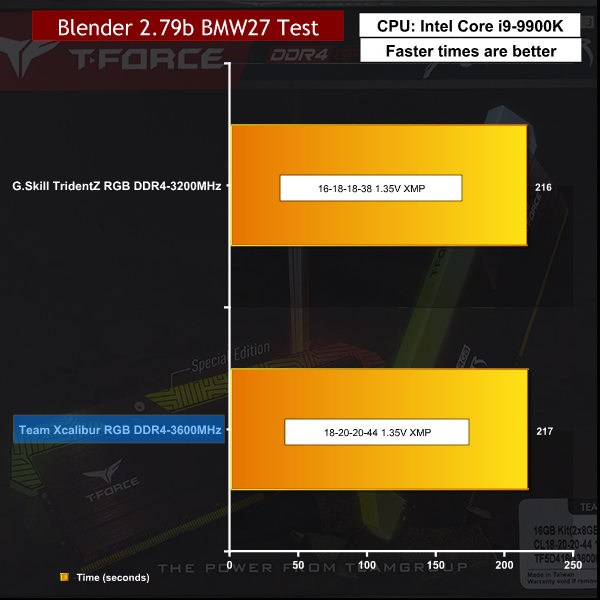 It was clear the correct approach is to install the software that comes with the motherboard and to ignore TForce Blitz entirely, and this approach worked just fine. 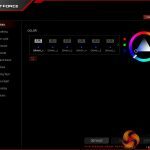 Team states their RGB Ram is compatible with the four major motherboard RGB suites (Asus Aura Sync, Gigabyte RGB Fusion, MSI Mystic Light Sync and ASRock Polychrome Sync) and we have no reason to doubt their word. 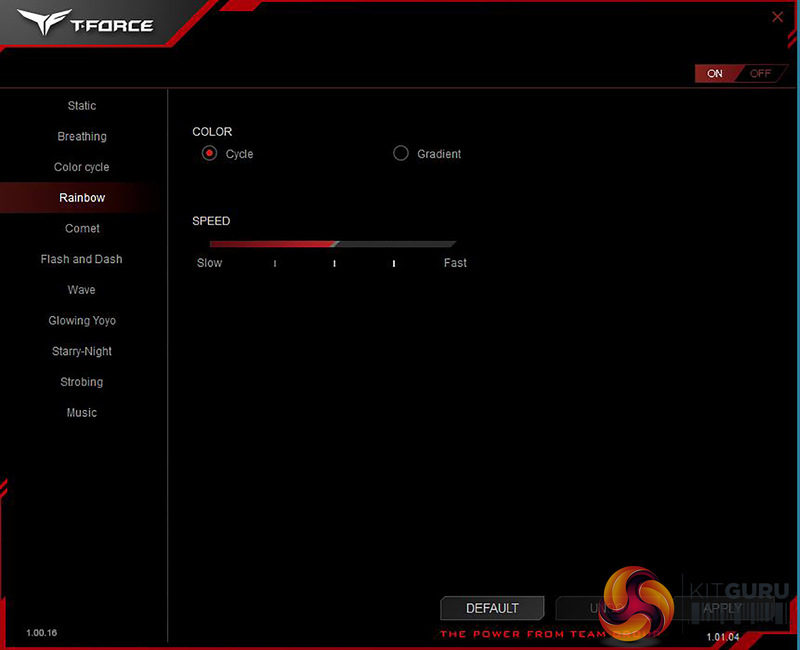 Clearly if you have a non-RGB motherboard, you use TForce Blitz to control the RAM lighting. 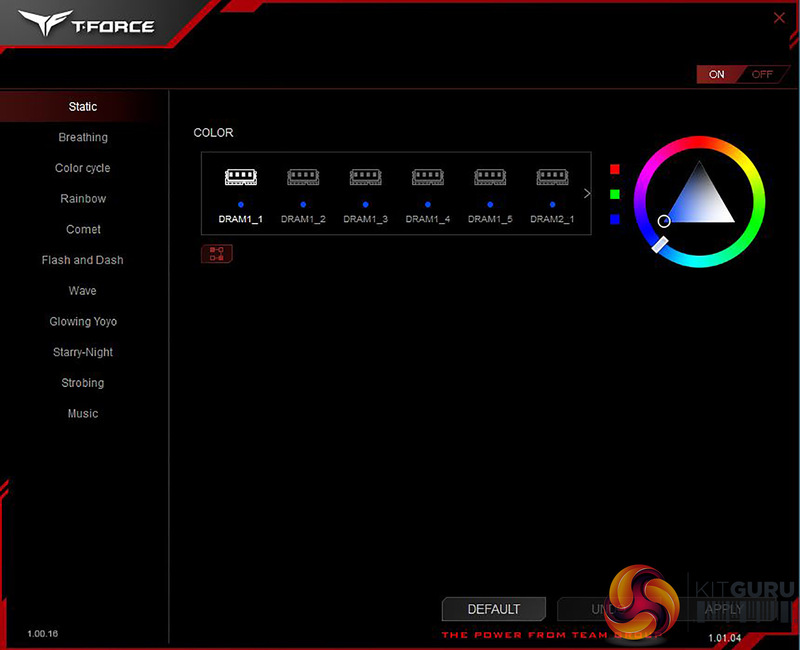 The lighting and the various patterns looked absolutely fine and were nothing out of the ordinary. 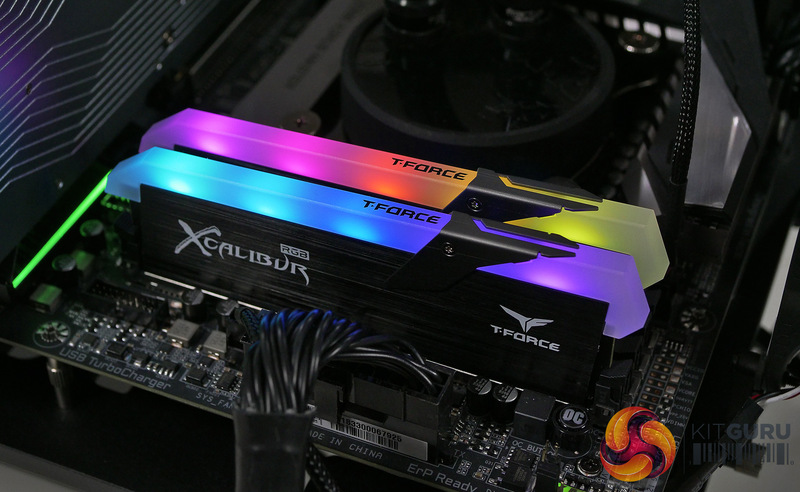 The most immediate observation we made is that each DIMM has five LEDs along the top of the heat spreader and they are clearly visible under the diffuser. 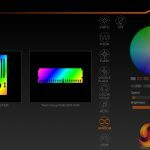 We are confident you will watch our video and either be satisfied by the effect or will be unhappy you can identify each individual LED. 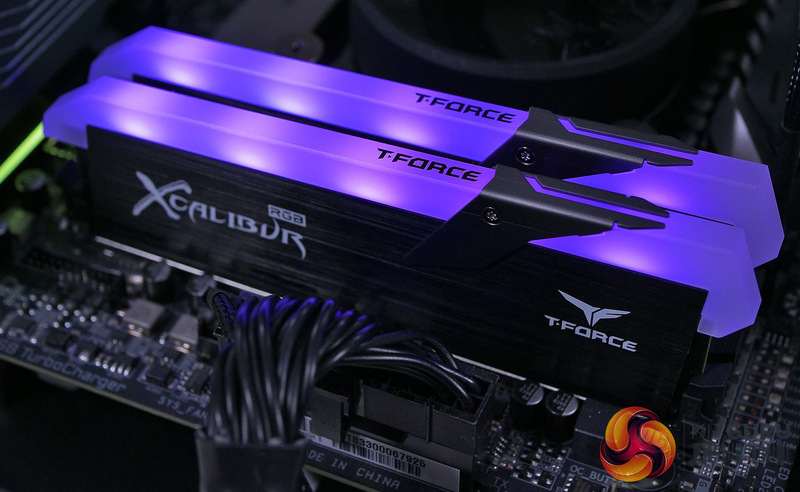 We felt the lighting looked good but had our concerns about the height of the modules and the way the heat spreader is angled. 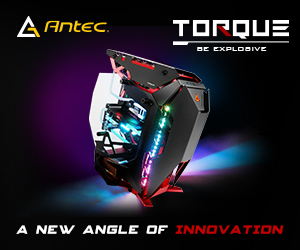 If you are building a small and compact PC this may cause you issues. 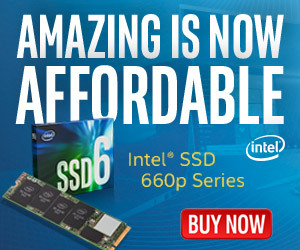 On the other hand, if you have a case with plenty of room the size of the memory may well be an irrelevance. 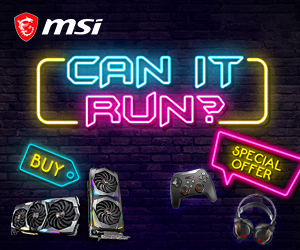 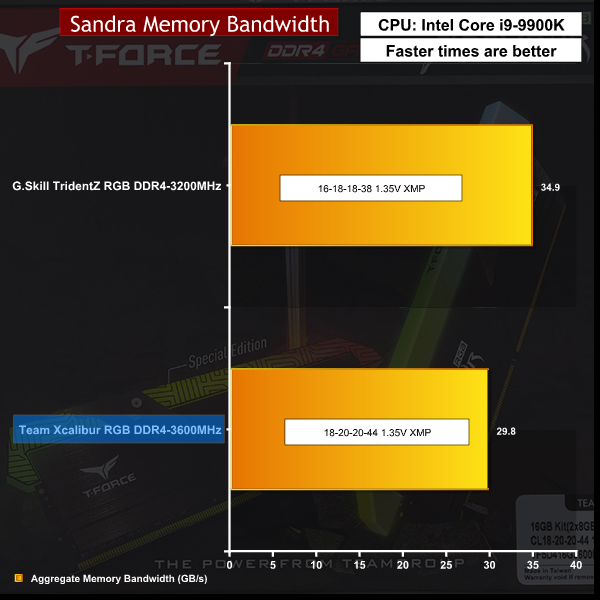 We have said it before and we will say it again, our main interest is that DDR4 is stable at its rated XMP speed. 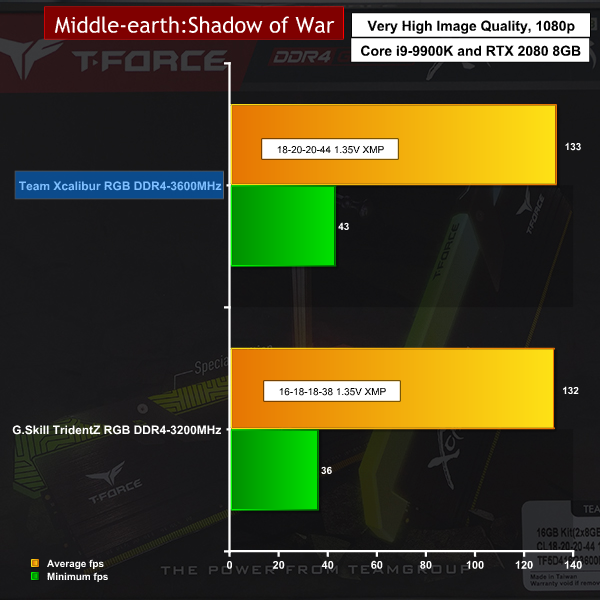 In the real world the timings do not make much difference from one application to another, although we consistently see higher minimum frame rates in games when we use faster memory. 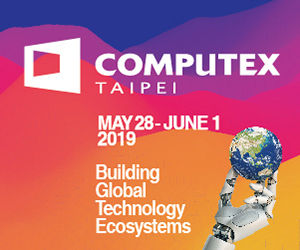 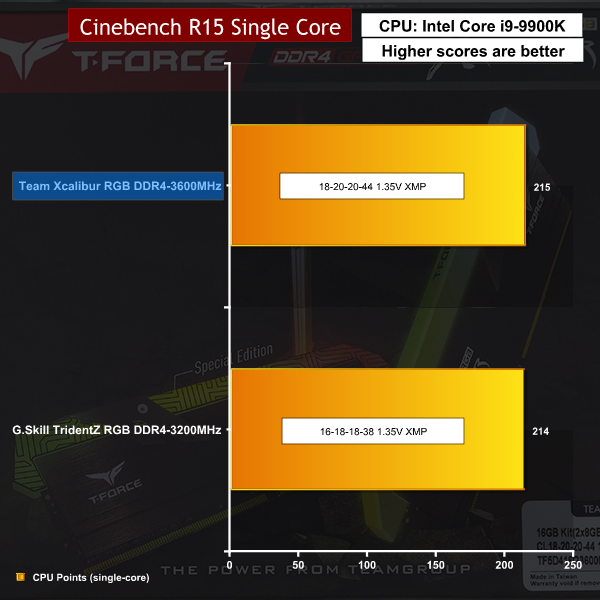 This is not solely connected to the clock speed or the latency timings but seems to involve the bigger question of compatibility. 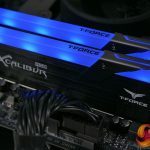 While the 3600MHz rating of the Team Xcalibur is welcome, the broader point is that it worked impeccably well with the Gigabyte Z390 Aorus Master. 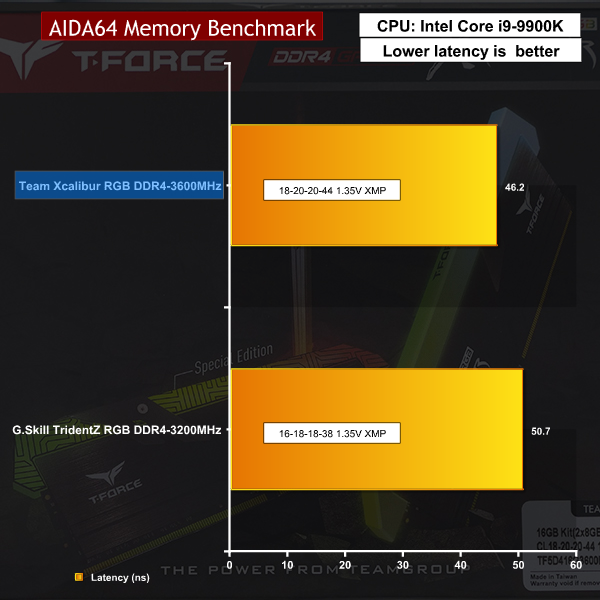 In synthetic benchmarks such as AIDA64 we see the exact opposite situation where faster memory has better read and write speeds, and as a result the Team 3600MHz RAM looks good in our test result charts. 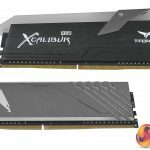 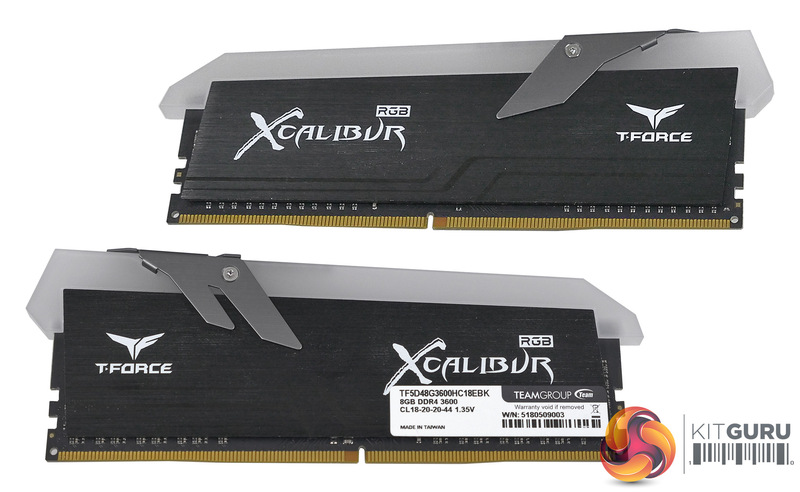 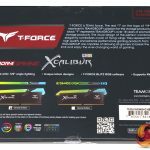 Team Group has produced some interesting DDR4 RAM in the T-Force Xcalibur RGB 16GB DDR4-3600MHz that combines decent performance with an interesting aesthetic. 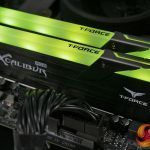 The version we were sent is the General Edition which means the diffuser over the LEDs is plain, as opposed to the Special Edition which has a printed pattern that may help to disguise the individual LEDs that clearly shine through on the memory we tested. 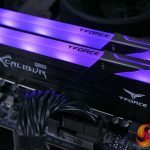 We were impressed by the way the Xcalibur RGB was completely compatible with Aorus RGB software, and as a result we were able to treat the TForce Blitz software as an unnecessary fall-back. 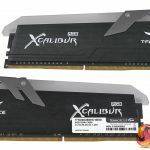 The ICs on the modules are Samsung B-die which means they come from the fastest family of RAM chips that money can buy, however these specific chips seem to be the slowest 3600MHz items on the market. 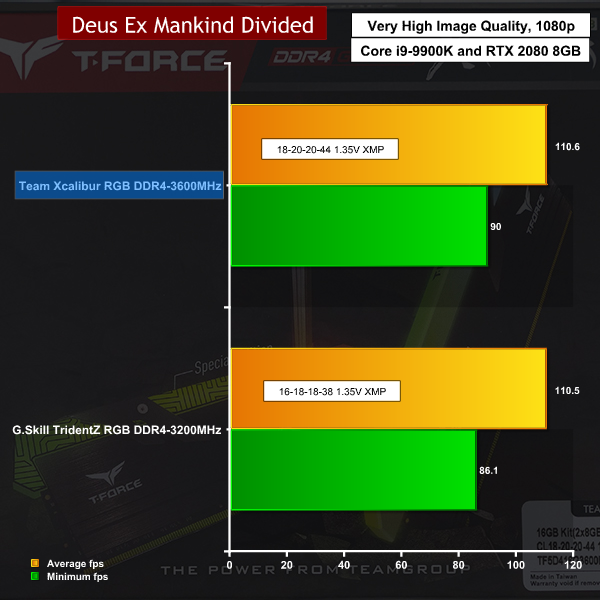 The specific timings used by Team are 18-20-20-44 and you do not have to look far to see that HyperX has 17-19-19-41, G.Skill has 17-19-19-39 and high end 8Pack Team is rated at 16-16-16-36. 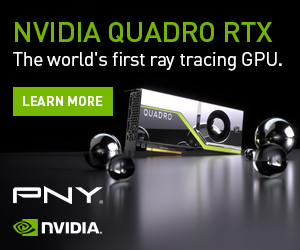 You will pay a premium of £20 (ten percent) for this faster memory so the decision comes down to personal taste and aesthetics. 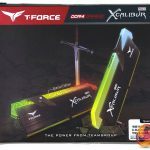 We can see that some people will appreciate the unusual styling of the T-Force Xcalibur, however our natural inclination is towards small, compact memory so we do not much like the angled heat spreader or the way it has an over-hang at either end of the module. 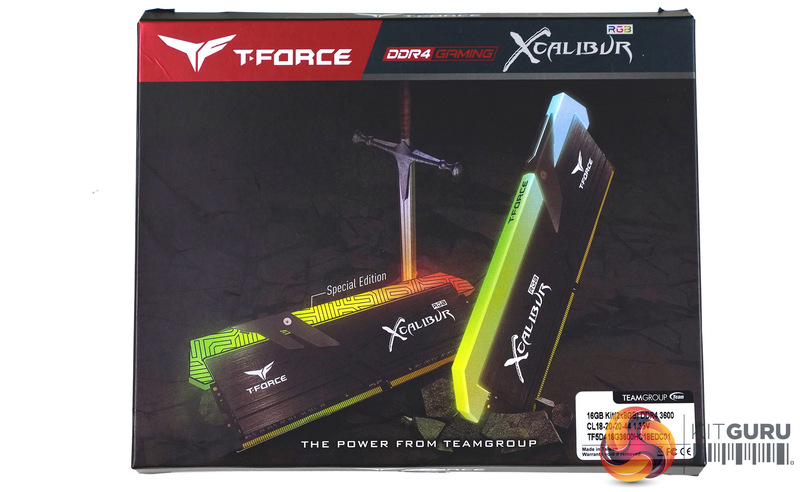 You can buy this T-Force Xcalibur kit for £188.99 from Overclockers UK HERE. 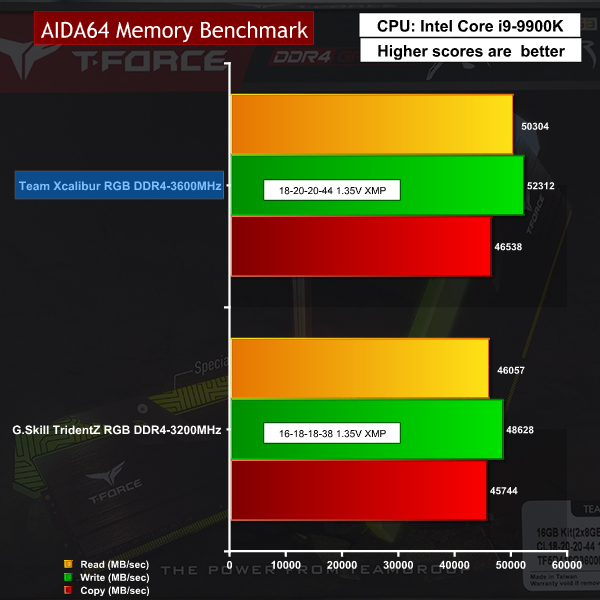 Good compatibility with motherboard RGB software. Timings look slow on paper. 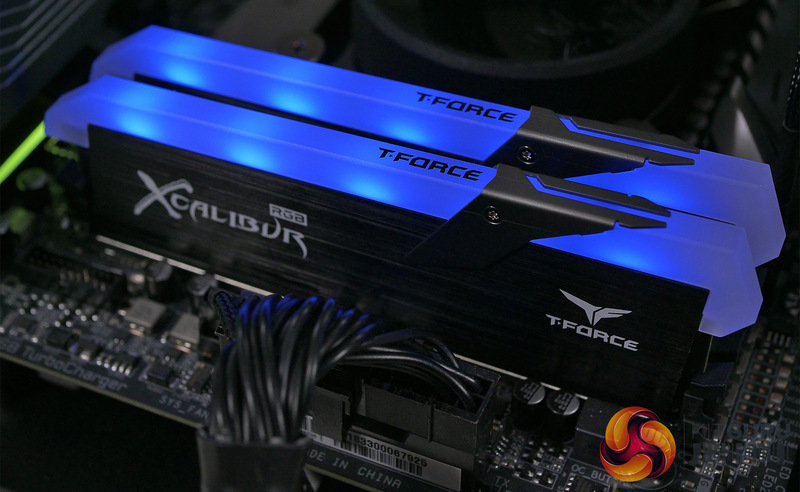 The heat spreaders and light bar stand tall. Heat spreader is angled and over-hangs each end of the module. 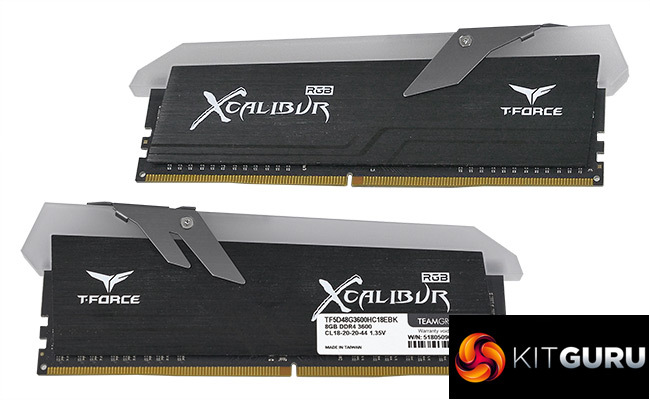 KitGuru says: Team T-Force Xcalibur RGB is decent value and the RGB compatibility is very good.